National Schools of Character are schools, early childhood through high school, that have demonstrated through a rigorous evaluation process that character development has had a positive impact on academics, student behavior, and school climate. These schools become part of a network of Schools of Character that serve as models and mentors to other educators and hold their designation for 5 years. WCEP is the sponsor for the State Schools of Character (SSOC) award program for Wisconsin. This award program, in partnership with Character.org, gives state schools recognition for their exemplary character education programs. Wisconsin is one of 30 states participating in the SSOC program. SSOC winners become eligible for the National Schools of Character (NSOC) recognition. Although designation as a State School of Character is a very affirming experience for schools, past participants have identified that the greatest aspects of the SSOC program were the professional growth and program development that resulted from the school wide focus on character education programs that this opportunity provided. In an effort to ​provide​ ​more​ ​resources​ ​and​ ​benchmarks,​ ​ways​ ​for​ ​more​ ​schools​ ​to​ ​participate, and​ ​better​ ​capacity​ ​to​ ​sustain​ ​the​ ​program​ ​long-term, there are four ways to interact in the Schools of Character process. Whether your school is learning what it means to be a School of Character or an experienced school re-certifying after the five year designation is complete, we want to help you on your journey. All public and private K-12 schools and school districts are eligible to participate in the State Schools of Character Program and can choose whichever tier is most appropriate for their schools’ needs. 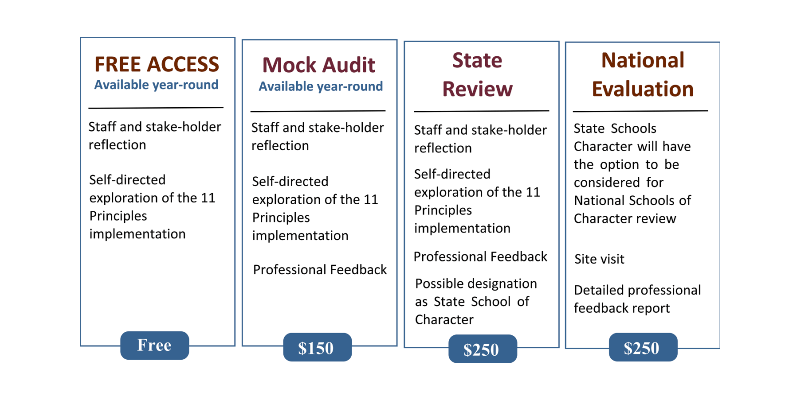 For schools that are ready for State Review but are challenged by the $250 fee, WCEP will reimburse the $250 fee for WI applicants once Character.org verifies receipt of the application, and the school submits a request for reimbursement to WCEP.